Mai Dhai Sindhi Marwari Music Singer. She is great Artist of Sindh, she has sung lot of hit songs in Sindhi and Marwari. She is well know Singer of Sindhi Folk Music, Marwari Music, she created great name in Sindh Music and Marwari Music. She formed a Folk Band called Mai Dhai Band composed of Jamal Shab, a Harmonium Player and Dhol Player, Muhammad Fakir and her band has performed in US at SXSW Music 2015. She was very popular when she performed in Lahooti Live Sessions Program. Her most popular songs such as "Sarark Sarak", "Mann Mohira" and lot of other Classical Music songs. 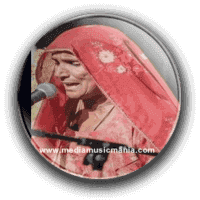 She has sung great songs in marriage ceremonies in different villages of Thar and other local areas. She has sung Waee Sindhi Music and performed in an assortment of ways utilizing a string famous songs. Waee, for the most part called Sindhi Kaafi, is found in the concealing spaces of Balochistan, Punjab and Sindh. I have selected below most popular Music of Mai Dhai. Mai Dhai was born on 1920 in Manganiar Rajasthan, after Independence of Pakistan she was shifted to Havili Umerkot Therparker Sindh. Mai Dhai belongs to Muslim Langha Family from Manganiar Rajhastan, her mother was a famous Singer of her tribe from Jodhpur India. Music from Sindh local area is sung in Sindhi, and is all around performed in either the "Draws" or "Waee" styles, she was also very popular and she has sung super hit songs in her own style.